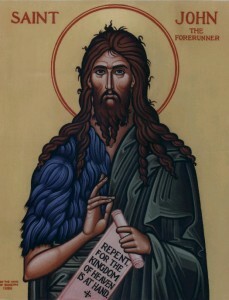 God chose to speak through a wild man known as John the Baptizer who dressed in animal skins, ate wild honey, and probably had the most unruly hair. The biblical description of his dress and style resembled the prophet Elijah found early in Second Kings. Why then do we ignore God’s trend of speaking through those who diverge from the status quo? I write this in light of Palestine being granted a higher state status at the U.N. I write this while U.S. Senators talk of backtracking from the indefinite detention section in NDAA. I write this as people buy gifts for family and loved ones. I write this during Advent because it is this season that makes these events seem appropriate. Advent teaches us that the divine does not whisper through the powers-that-be, but through the lowly, downtrodden, the no-bodies. Luke begins by situating the time period in which Jesus lived, starting with the most powerful, Emperor Tiberius, to different local and religious figures. Yet it was not until the end of the list, the bottom of the totem pole, that God spoke. It was not the proponent of the military industrial complex, Tiberius who expanded the Roman Empire with force, nor Pontius Pilate who was the State head of Rome in Judea. It was not the Jewish Political leader, Herod, who was more concerned with his own politics than practicing the Jewish faith. Nor was it those who lived as high priests. This stone is important for many reasons. First, it is the only archaeological evidence for Pontius Pilate. Second, it gives us a glance into how the powers-that-be viewed themselves in this era. To be powerful meant to be divine, hand in glove. Yet, this lectionary reading flips this normalcy on its head. Advent is a time to learn patience and to wait for Jesus. We are waiting for Jesus’ birth as well as for Jesus’ coming in our time. This reading compels us to reflect on whom we listen to in our society. Are we only listening to those with all the power? Are we seeking relationships with those with no social and economic advantages? I think our waiting goes in vain if we are not also seeking out different voices to challenge how we are conducting our own lives. May Advent be a time of struggle to wait for a just world, while living for justice through the expectations set by the down-trodden. Timothy Wotring holds a B.A. in Theology from Eastern Theology. He lives in West Philadelphia and works as a Youth and Family Ministry Coordinator at a United Methodist Church in Havertown, PA. He blogs at blackflagtheology.com and is interested in political, liberation, feminist, and postcolonial theologies. Timothy Wotring is a graduate of Eastern University in Saint David’s, PA. He lives in West Philadelphia and is a member of the Episcopal Church. He keeps a blog (blackflagtheology.com) and is interested in political, liberation, feminist, and postcolonial theologies.